Literary Arts is pleased to present an original hour-long talk by Malcolm Gladwell, bestselling author of The Tipping Point, Blink, and Outliers. 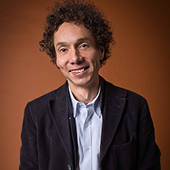 Born in England and raised in rural Ontario, Gladwell now lives in New York where he has been a staff writer at The New Yorker since 1996. Gladwell’s newest book, David and Goliath: Underdogs, Misfits, and the Art of Battling Giants, illustrates how fundamentally we misunderstand the true meaning of advantages and disadvantages. When is a traumatic childhood a good thing? When does a disability leave someone better off?David and Goliath attempts to uncover the hidden rules that shape the balance between the weak and the mighty, the powerful and the dispossessed. Purchase a $65 ticket and receive a free copy of David and Goliath at the Schnitz on the night of the lecture.